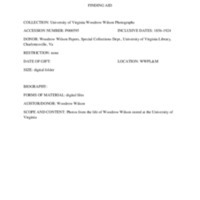 Woodrow Wilson Papers, Special Collections Dept., University of Virginia Library, Charlottesville, Va.
: Woodrow Wilson was born in Staunton, Virginia before a starting on his eventual path to Princeton University. He later became its President before running and winning the election for the governor of New Jersey. In 1912 he began his run for the President of the United States of America. Woodrow Wilson Presidential Library and Museum, “University of Virginia Woodrow Wilson Photographs Finding Aid,” 1856-1924, P000595, University of Virginia Woodrow Wilson Photographs, Woodrow Wilson Presidential Library & Museum, Staunton, Virginia.